Comparing Seven City-Region Case-Studies in Three Research Postgraduate Teams from Two Methodological Modules: Global Cities: Sustainability and So­ciety & Public Policy, Governance and Strategic Change in Cities. (Msc Global Sustainable Cities 2015-2016). 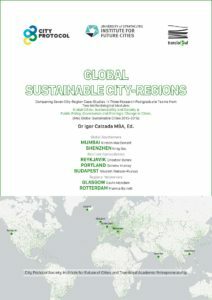 This policy report, entitled ‘Global Sustainable City-Regions,’ covers the work developed by the lecturer, Dr Igor Calzada, MBA, as the editor of the publica­tion and students/participants of the first edition of the New Masters course MSc in Leadership for Global Sustainable Cities from September to December 2015. The first module, entitled ‘Global Cities: Sustainability and Society,’ consists of six methodological units. Thereafter, the second module, entitled ‘Public Policy, Governance and Strategic Change in Cities,’ consists of five methodological units. The policy report focuses on three urban global issues in a comparative ba­sis. The MSc was developed in a team-based dynamic by applying qualitative action research methodologies to understand and interpret each case and to benchmark and contrast with other cases that addressed the same global ur­ban issue. produce a full case study by applying the two-sequential-module methodology. Dr Igor Calzada MBA, Kirsten MacDonald, Ning Qiu, Criostoir Dynes, Gemma Murray, Nikolett Watson-Puskas, Gavin McAdam and Frankie Barrett.